Interested in bamboo? 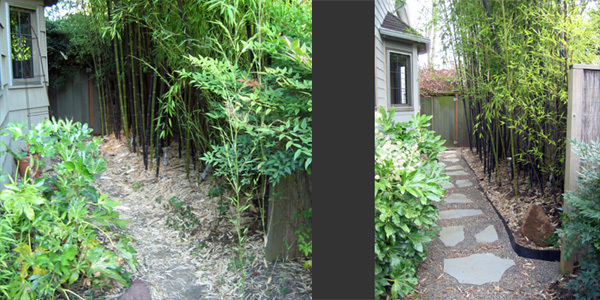 Bamboo Rescue is a landscaping service dedicated to bamboo. 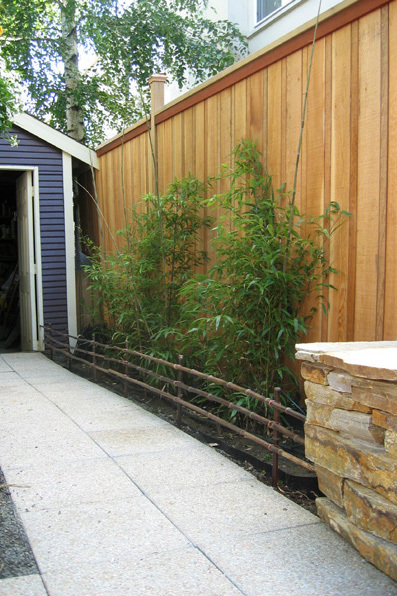 A barriers purpose is to stop bamboo rhizomes from growing outwards. There are two methods of barrier installation. Picking out the correct bamboo species to fit needed height, habit and color. If a standard hedge style planting is needed a 3 to 4 foot spacing is a good place to start. At planting time it is a good idea to amend the soil with Compost or mulch. 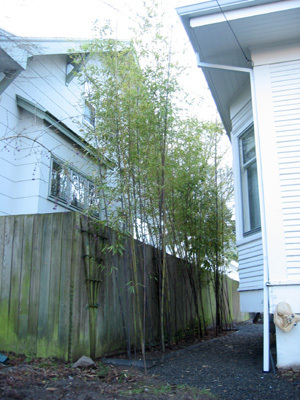 Clumping bamboo does not need a barrier, only invasive bamboo's do. 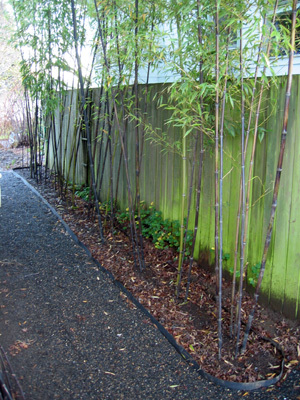 Planting bamboo without a barrier is fine. Certain precautions should be followed. It is important to have ample space around the grove. When rhizomes grow outwards, you will need working space to dig them up, especially if it's near a fence, your house, your neighbors, driveways, sidewalks and property lines. Also at least once a year rhizome check and cut is in order (see maintenance for more info) especially after the grove has been established for a couple years or more. 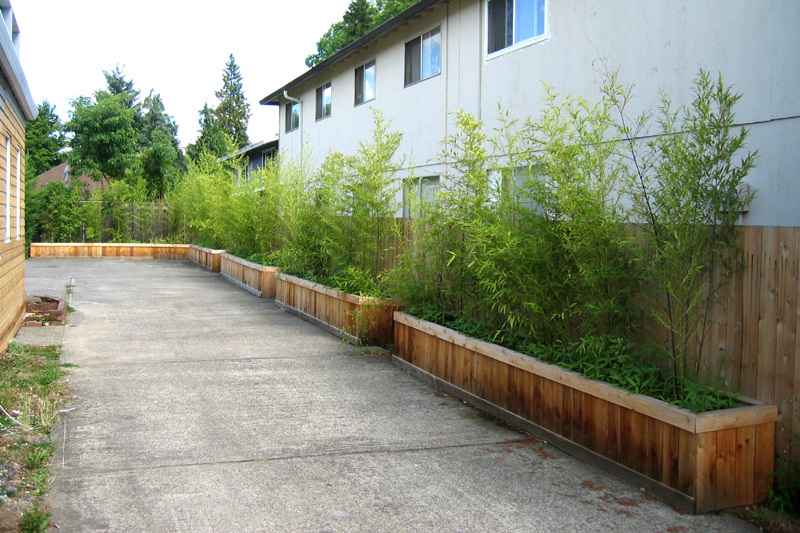 Bamboo rhizome barriers can be placed around an exsisting bamboo grove as well as a new planting. Barriers are 30 inches tall (2.5 feet) and 60mil thick (roughly 1/8 inch) and any length needed. 3 inches must be left showing above ground in order to visually see when a rhizome is trying to escape. 27 inches will be buried into the ground. If a full loop is needed the barrier needs a stainless steel clamp to join the ends together. If many years go by without rhizome pruning maintenance the barrier will not be able to hold back the bamboo rhizomes willingness to colonize. A barrier is useful so that the rhizomes do not invade nearby perennials planting's or under the fence towards the neighbors vegetable garden. These rhizomes(roots) will get stopped by barriers and get redirected, running along the barrier. However the rhizomes will keep growing and in time will get cramped up along the barrier edge and maintenance will be needed to remove the excess rhizomes. 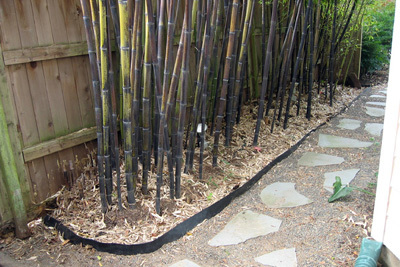 It has been know that a non-maintained fully enclosed barrier loop installation can be broken and burst at the seam due to the overpowering bamboo rhizomes. Bamboo has a simple pattern of growth in order to survive. It searchs out water and nutrients. If you do not provide these fundamental elements, it will go searching for them. Before and After a barrier installion. � 2018 Lloyd DuBois, Bamboo Rescue. All rights reserved. All contents of this website are protected by registered copyright and may not be copied, manipulated, or used in any way without prior permission.